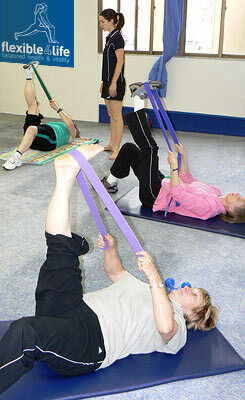 Flexible 4 Life is a community focused organisation providing AFFORDABLE class instruction for adults and older adults. Our classes are fun, social and provide a relaxed, non-competitive environment for people of all fitness levels to participate. increase flexibility, strength and fitness. Learn core strength and balance exercises to help achieve and maintain ease of movement. Get motivated to be active and stay active in a caring, safe, fun and friendly environment. Flexible 4 Life classes are suitable for all fitness levels and physical abilities, including those who are unfit or overweight; pain sufferers and those with physical disabilities. We aim to provide opportunities for everyone to achieve their goals whether to recover after surgery or injury or become more mobile and active through targeted, functional exercise that will improve your quality of life and overall wellbeing.